This top-rated beef stew is a symphony of flavor and color, and it's surprisingly easy to throw together in the slow cooker. It's a classic combination of beef stew meat, potatoes, carrots, and tomato soup. Browning the beef in bacon drippings makes for a rich and flavorful gravy. The slow cooker is a real convenience, especially if you have other things to do. Just throw it all together in the crock and let it cook unattended while you go about your day. If you have the time, you might prefer to cook the stew in a more conventional way, on the stovetop. It's just as easy, and you'll have a rich and hearty stew in about 3 hours. Adapt the stew to suit your family's tastes with alternative vegetables and seasonings. Parsnips and rutabagas are excellent in beef stew. Or add about 1/4 cup of pearled barley if you like. The stew is simply seasoned with salt, pepper, and optional garlic powder. Feel free to change the seasoning up with a seasoned salt blend or Creole seasoning, or use a salt-free herb blend along with the salt and pepper. A 14.5-ounce can of diced tomatoes will add some extra chunkiness and flavor to the tomato-based liquids. For extra beef flavor, use unsalted beef stock instead of water. 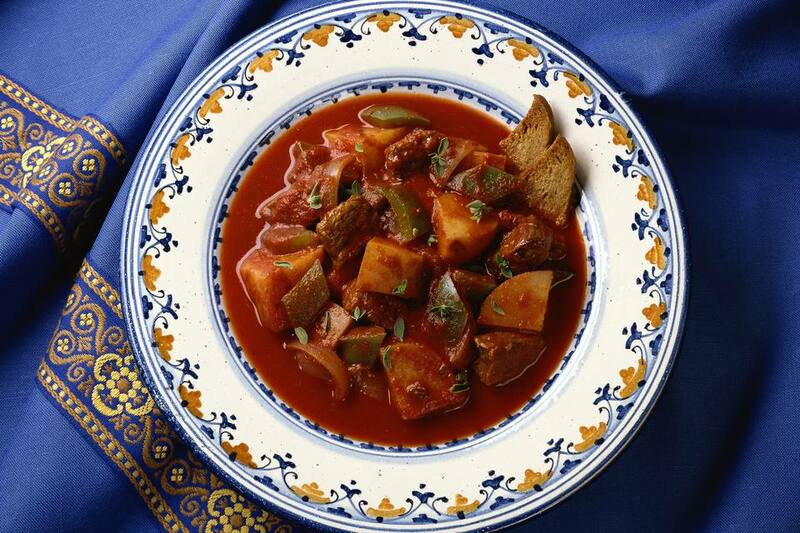 Serve the stew with crusty bread or rolls and a salad. Cut the beef into 1-inch pieces. Heat the bacon drippings in a skillet over medium-high heat. Add the beef and cook until browned, stirring frequently. Add chopped onions and sliced celery and cook until tender. Transfer meat and onion mixture, remaining vegetables and seasonings, the soup, and a soup can of water to the crock. Cook on low for 8 to 10 hours or on high for 5 to 6 hours. Check the stew occasionally and add a little water if necessary. Heat the bacon drippings in a stockpot or Dutch oven over medium-high heat. Add the beef and cook for about 5 minutes, or until well browned, turning frequently. Add chopped onions and sliced celery to the beef and continue to cook until tender. Add the remaining vegetables and seasonings. Add the tomato soup and a soup can of water (or unsalted stock). Simmer over lowest heat for about 2 1/2 to 3 hours, or until meat and vegetables are tender.